We have always had many successes in local sporting competitions but we are delighted to report that recently we have had a number of successes in national competitions. Our two most recent are as follows. 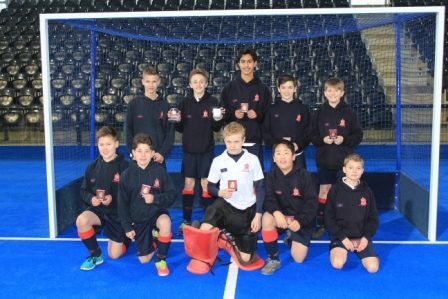 Our Under 13 boys’ hockey team who were crowned ISA National Champions after playing some amazing hockey at the Olympic Park in London. The boys played extremely well in their first set of games coming top of their group. In their next game they had to hold their nerve in a tense penalty shuffle competition; they remained strong and won 2-1 going on to play Lingfield in the final. A 1-0 victory against Lingfield saw the boys become the new ISA National Champions! Mr Thorogood recounted their exploits in assembly last Friday before the team were re-awarded their winners medals and trophy. This is an outstanding achievement. Well done boys, we are all very proud of you. Also, many congratulations to Jessica Hall who won the National ISA Cross Country Championships at Princethorpe College. Jessica has had a remarkable season having already won 3 consecutive titles including the District & County races and the ISA North Cross Country Championships in January. To be crowned ISA Cross Country Champion is an exceptional achievement. Well done Jessica for such a great performance throughout the season.